Today, John Draper's sister. The University of Houston's College of Engineering presents this series about the machines that make our civilization run, and the people whose ingenuity created them. The photo of a young woman gazes at me from this century-old magazine article about photography. Her name is Dorothy Catherine Draper and the picture was taken by her brother John around 1840. 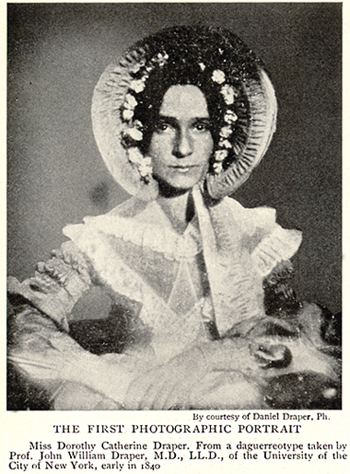 The magazine calls it the first photographic portrait. Maybe. It's certainly the first portrait of a woman with her eyes open. John Draper was a 29-year-old professor of chemistry in the NYU medical school. He'd been born in England, finished college there, and married when he was only 20. A year later his whole extended family moved to Virginia where he'd meant to take a teaching job. But the job had vanished when he arrived. So he did research in chemistry on his own, published papers, then entered and finished medical school. All the while, sister Dorothy, working as an artist, helped to support him and his wife. And that paid off. In 1837, NYU offered him a professorship. Louis Daguerre published his new daguerreotype process two years later and Draper pounced upon it. He immediately saw how the method could be adapted to portrait photography. And that's how this haunting photo of his sister came into being. Draper made many improvements to photographic processes. He was able to create the first photo of the moon that revealed its surface features. Still, his interest was in photochemistry. Photography was only a sidebar to that work. 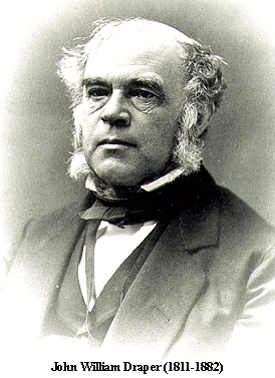 Draper was a co-discoverer of the first basic law of photochemistry -- called the Grotthuss-Draper Law. It says that light must be absorbed by a system to bring about photochemical change. He also gave us the so-called Draper point. He realized that any object, regardless of material, glows dull red at 977oF. That was important in the evolution of quantum mechanics. Max Planck gave us his quantum radiation theory, a half-century later. In it, he used the fact that, at a given temperature, all bodies emit peak energy at the same wavelength. The Draper point is simply the temperature for the wavelength of the color dull red. Draper did much more. And he became president of New York University, founder of its Medical School, writer of important chemistry textbooks, historian, philosopher of science ... -- all after he'd given us that haunting portrait of his sister. She sits unblinking for its 65-second exposure -- still as a sphinx in her lace and bonnet. Draper dusted her face with white flour to enhance the contrast. (He did not have recourse to Photoshop.) The result actually worked. Dorothy's face is surprisingly natural. By 1906, my magazine was able to report much more advanced photography -- photos of a comet and of a leaping tarpon. It shows a set of photos of an area in the Canadian Rockies, followed by a topographical map made from them. But after all that, my eyes are drawn back to the love invested in that photo of Dorothy -- still young and still honored, two centuries later. H. W. Lanier, The Marvels of Photography. The World's Work, Vol. XI, No. 3, Jan. 1906, pp. 7163-7173. See also the Wikipedia article on John William Draper and this site with additional biographical material. Images: Dorothy Draper from The World's Work article. John Draper courtesy of Wikipedia Commons. Lummer-Pringsheim plot below from Tien and Lienhard. 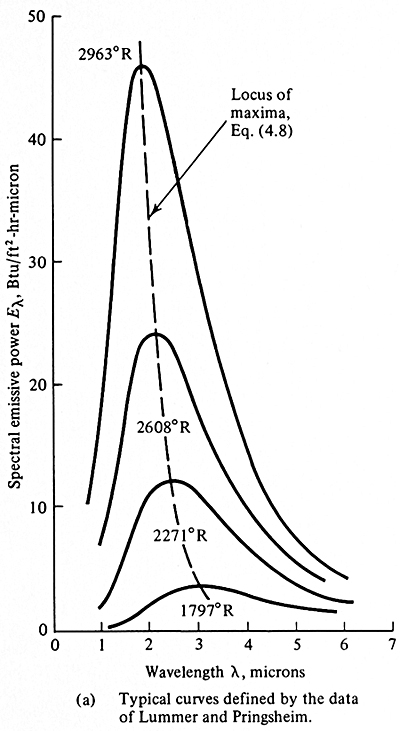 Below: The Lummer and Pringsheim data for the emissive spectrum of black bodies as a function of wavelength. The locus of maxima (the dashed line) would include the Draper Point at a wavelength of 3.6 microns. It would appear on that line if it were extended toward the bottom right of the graph.